A final year product design and technology student from Loughborough University, and now a client of Serjeants, has received international coverage of his latest invention – an underwater jetpack. Archie O’Brien designed and developed a functional prototype of his underwater jetpack in just 12 months as part of his final year project at Loughborough Design School. Inspired by his love for adrenalin, exploration and nature, Archie took to investigating underwater propulsion devices and quickly discovered that current products on the market were either too slow or too expensive and very heavy. Archie custom-designed a more compact propulsion system, powered by a 3D-printed impeller, that can propel a swimmer at speeds of up to eight miles per hour. The underwater jetpack, with its own patent pending propulsion system (thanks to Serjeants) is the fastest underwater jetpack in the world which can be easily ported between dive sites. There are plans to put the underwater jetpack into production and the first models could go on sale as early as 2019. Archie contacted Serjeants at the end of May to discuss the intellectual property protection that might be available to him, having not received any significant advice about protecting his product previously. Time was critical as the underwater jetpack was going to be part of the Loughborough University design show starting on 14 June, only two weeks later. Serjeants expert patent attorney, Tim Cadman, quickly identified that the technology behind the jetpack was suitable for patent protection. With permission from the university, we prepared and filed a patent application on Archie’s behalf. The application was filed on 13 June, the day before the design show. It was crucial to get the patent application on file before the design show started as publication of the product at the show would have meant any later patent applications might have lacked novelty over the disclosure made at that show. 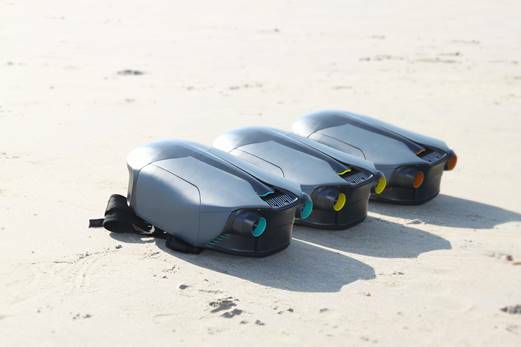 Following the Loughborough University design show, Archie’s underwater jetpack has received coverage in The Mail Online and Gizmodo. Other big names to give it a mention are Digital Trends, Design Boom and Cheddar. Do you have an idea that needs protecting? If you have a unique product or design that you want to protect, our expert patent attorneys can provide advice and guidance on the best way forward. Contact us here or call 0116 233 2626.